I’m a big fan of Charles A. Fricke who is a regular contributor to philatelic publications and a member of the APS Writers Unit Hall of Fame. Fricke often takes a postal card or picture postcard and tells a broader story about the item than its postal history. I identify with that approach because my primary collecting interest is postal items that also tell a library history story. In the March issue of the American Philatelist Fricke has an article titled “Reflections of the NRA”. The NRA he refers to is the National Recovery Administration, a Depression era program that promoted fair competition practices for businesses. The stimulus for his article was a number of postal cards in his collection with a logo used by businesses that participated in the NRA program. It immediately brought to mind an advertising postcard in my collection which has a sticker of the NRA logo attached. 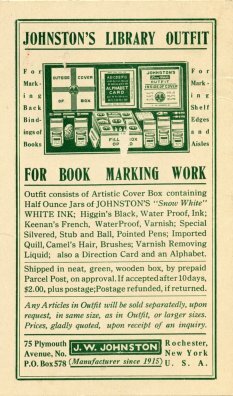 The card (shown above) is an advertisement for Snow White products for libraries manufactured by the J. W. Johnston Company of Rochester, NY. 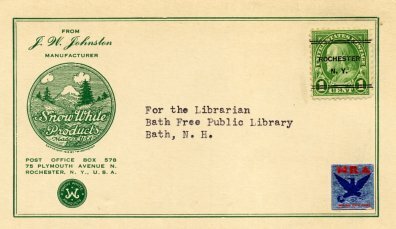 It is addressed to the Bath Free Public Library in Bath, NH, and is franked with a Rochester NY precanceled one cent Franklin postage stamp. On the back of the card is an elaborate advertisement for “Johnston’s Library Outfit”. A little investigation found that J. W. Johnston was John White Johnston who turns out to be somewhat of a Renaissance man. In addition to inventing a white ink that could be used to mark books and photo albums, he was a historical researcher and publisher with an emphasis on Gettysburg in the Civil War, and a musician who founded a Scottish pipe band. Before reading Fricke’s article I had mistakenly jumped to the conclusion that the NRA was the National Rifle Association. Thanks to Charles for setting me straight.